Arriving Mandalay, our local representative will be at the airport to welcome you & transfer to hotel. Afternoon city tour includes Mandalay Fort, Shwenandaw Kyaung, Atumashi Kyaung, Kluthodaw Paya and Mandalay Hill for the sunset. Dinner at hotel. 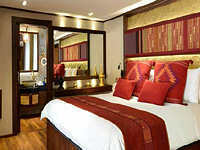 Join cruise boat in Mandalay and settle into your suite. Our first stop will be Mingun, a sleepy attractive village where an ox-cart will be your mode of transport. 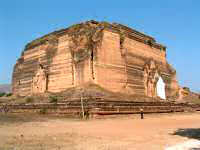 First we will stop at the unfinished Mingun pagoda. Construction began in 1790 and today a huge pile of bricks is all that remains of King Bodawpaya’s grandiose scheme. Nearby stands the massive Mingun Bell, one of the world’s largest (more than 12 feet high and 16 feet wide). Lastly we come to a most unusual white pagoda Myatheindan (Hsinbyume) built by King Bodawpaya’s grandson Bagyidaw in memory of his favourite wife, the Queen Hsinbyumei. Around the base are seven concentric circular terraces, the structure itself is symbolic of Mount Meru. A late afternoon visit to Sin Kyun the Sanctuary adopted village. This wonderful community will show you the typical life of the villagers and give you an opportunity to see a way of life seldom viewed by outsiders. For the adventurous a dolphin-watch in the company of local fishermen is on offer. The river is wide and the boat needs to take a zig-zag course to avoid the constantly shifting sandbanks. One of the few bridges across the Irrawaddy heralds the ship’s arrival at Nwe Nyein the home of the pottery makers. Vast mat-sheds are filled with pots of all shapes and sizes; watch the master-potters deftly working the wheel with their feet. In the middle of lush farmland sits the ancient city of Halin. Dating from the Pyu Dynasty (1-9 CE) much of the town has been excavated and is well presented to the visitor, so an excellent afternoon excursion by coach. The site, along with two other Pyu towns hopes to achieve World Heritage status in 2014. The river now narrows as Male with its two white stuppas side-by-side marks the entrance to the Third Defile or gorge. A beautiful section of river unfurls as old vessels full of huge teak trunks sail slowly downstream, their pilot boats ever watchful for the sandbanks. The undulating Min Wun hills run alongside the river like a dragon’s back. We stop at Aman Thar to watch the gold-panning; over the hill is Mogok, famous for ‘pigeon blood’ rubies and sapphires. On past Noba railway terminus renowned in World War II with an Allied cemetery sited nearby. We dock for the night at Sinkhan. Take an evening stroll around the village and a visit to Tup Kee Kon Monastery. Still travelling up-stream we pass Moe Darr and then on to Bhamo the most northern navigable point of the river for large craft. Here we will visit the bustling town which boasts a vibrant market; with many stall owners in their ethnic dress - maybe Paulaung or Lisu. We now head down-stream, the river narrows with the entrance to the Second Defile marked by a ‘spirit rock’ in the shape of a parrot. As you relax into the comfort of our cruise boat enjoy the river scenes - dugout canoes low in the water ferry a monk, ladies in conical hats and a couple of bicycles from shore to shore; bamboo rafts, rice barges and other craft abound. 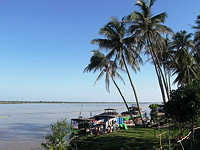 We will stop at Shweku to explore Kyun Taw (Holy Island) which is said to rise and fall with the water level. An early evening stop at Moe Darr for a wander in this prosperous market village with fine old wooden shop-houses, fresh produce on show and good smells waft from the food stalls, watch the sun set over the river. We continue downstream to Katha a charming small town featured in ‘Burmese Days’. Tuk-tuk’s will ferry you to Orwell’s own house, the former British Club and along Strand Road. Katha is a centre for Ngapi the fermented fish paste, fascinating to watch its making but be prepared for the smell. After Katha the river widens again to around a kilometre across - sand everywhere so it is a true art piloting the boat. As an East India Captain remarked in the mid-18th century 'the width of the apparent river was excessive, and it was difficult to see where the proper channel lay'. Groups of glorious spreading Rain (Saman) trees shade parts of the shore line. We stop at Tagaung another of the Pyu Dynasty (1-9 CE) cities, the city wall can be seen, and there is an interesting museum. As the city is on latitude 23 degrees there is a post marking the Tropic of Cancer. We dock for the night beside Hman Thar a small village. The Thi Ha Taw pagoda is our first stop of the morning, a tiny island supporting a 12th century pagoda. On the terrace of which sits an image of the monk Shin Upagutta, known as the ‘monk of the southern sea’ and guardian of the river. The river is back to its noble personality wide and slow, the surrounding land dotted with pagodas large and small, along the route we will stop and explore several small villages, such as Kyauk Phyar, a logging village, where life is much as it has been for centuries. This morning we will sail to Mandalay where we will see the Mahamuni Pagoda, one of Myanmar’s most religious monuments housing the revered Mahamuni Image, said to be sculpted in the presence to the Gautama Buddha during a visit to the kingdom of Arakan. The 12’6” high-seated image has a legendary origin and a complex history. Continue on to visit Shwenandaw Monastery, the only palace building to survive the bombings of World War 11. This beautiful teak monastery had been the apartment of King Mindon and after his death in 1879 his son Kong Theebaw moved it out of the palace. Lastly a visit to the Kuthodaw Pagoda (Maha Lawka Marazein) built by King Mindon in 1857, a copy of the Shwezigon Pagoda in Bagan. Kuthodaw is often called ‘the biggest book in the world’, for surrounding it are 729 marble slabs inscribed with the Tripitaka texts (Buddhist cannon). In the afternoon we will explore the once mighty capital of Ava (Inwa) which is now a sleepy village but has plenty to offer the visitor. Pony trap is the best way to get around and of the monasteries the most beautiful is Bagaya Kyaung famous for its 277 teak pillars and wonderful carved doors. The local lacquer workshop makes the monks' black offering bowls. 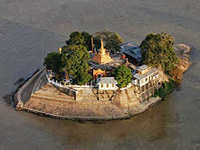 We will dock beside the ‘pagoda sprinkled’ heights of Sagaing. 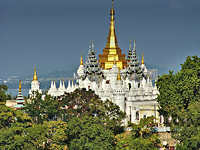 Sagaing Hills are an important religious and monastic centre and home to some 554 monasteries and 6,000 monks and nuns. We will take a short stop at several of the monasteries and pagodas but it is the views from the top of the hill at the Soon U Ponya Shin Pagoda which is breathtaking. Below and all around pagodas of varying shapes and sizes dot the landscape. Scattered amongst them are fine European-style stucco buildings. Through the middle of this picture glides the Ayeyarwady, and beyond the spires of Mandalay Hill gleam. Before returning to the ship we will visit a silversmith’s workshop in the village of Ywataung where the craftsmen are renowned for their engraving skills and then on to the Kaung Hmudaw Pagoda. In the afternoon we will drive over the Ayeyarwady River to Amarapura, ‘The City of Immortals’, in its heyday a city of some 200,000 inhabitants. The leisurely ‘clack-clack’ from the looms of the cotton and silk weavers has replaced the noisy bustle of this former capital. 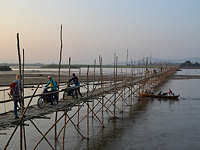 We will visit one of the textile workshops, followed by the U Bein Bridge at 5.30pm, a spectacular place to enjoy the sunset. This long teak bridge which snakes across the Taungthaman Lake was constructed in 1847 by Mayor U Bein. The cunning mayor pocketed the money allocated for the bridge and re-used the timbers from the abandoned Ava Palace. Pakokku, just south of the confluence of the Ayeyarwady and Chindwin Rivers is our next stop. Pakokku is famous for tobacco, sugar palm (jaggery) and was the site of a famous battle at the end of World War 11. At 10am trishaws will take you to the local market where mouth-watering fruit and vegetables are laid out with consummate style, an extra touch provided by sprigs of flowers on each stall. Then to the cheroot factory, watch the girls roll and make the cheroots with great speed and dexterity. We continue downstream, on a bend of the Ayeyarwady high up stands the Bupaya or 'pumpkin’ pagoda marking the northern most point of Bagan. 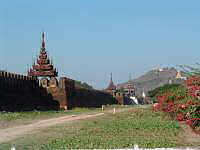 After lunch we drive to the southern area of Bagan, Myinkaba village and the Manuha Temple. Built by deposed Mon King, Manuha in 1059 this two-storey temple conveys a melancholy message. The three Buddha images therein are uncomfortably large for their enclosures, thus illustrating his captivity and mental stress. Beside the Manuha Temple is the charming Nanpaya Temple, King Manuha’s residence, which boasts some beautiful stone carvings. Close by is another Mon-style temple, Gubyaukgyi built by Prince Rajakumar in 1113, the inner sanctum is decorated with frescoes, which have been restored. Visit the famous lacquer stores near Lawkananda Pagoda. 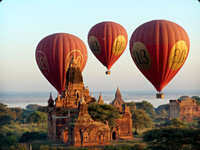 At 5.30am you can take an optional balloon tour (extra charge) to capture a birds-eye view of the Bagan plain. In the early morning mist, the pagodas seem to ‘loom, huge, remote and mysterious’, gradually as the light dawns and the sun illuminates the landscape the scene becomes alive. 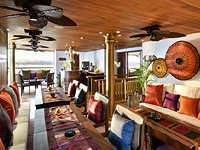 Or watch the sun rise from amidst the plain on a temple terrace in the company of a meditation expert. After breakfast we will travel by bus to see the Ananda Temple. Completed in 1091 AD, of the ‘four great temples’ in Bagan, to which folklore attributes various superlative qualities Ananda is deemed ‘the most beautiful’. The temple is shaped like a perfect Greek cross and rises in graduated terraces to a height of some 170 feet. Inside stand four magnificent golden Buddha statues. Within the temple grounds is the Ananda Oakkaung, the well preserved remains of a monastery complex with murals depicting Burmese life from the 11th, 12th and 13th centuries. After which a traditional horse cart will take you to Htilominlo Temple a two-storey red-brick temple built around 1211 AD. It is a magnificent structure, though now heavily restored it stands 150 feet high and 140 feet wide at its base. Inside four Buddha images face the cardinal points on both levels of the building. Some of the old murals can still be seen as can a number of the friezes. Several old horoscopes, painted to protect the building from damage, can be found on the walls. During the afternoon we sail down to Sale passing Chauk one of the original oilfields where the nodding ‘donkeys’ (oil well pumps) stand by the river bank still working away. Sale is a perfect small community to wander around on foot or by trishaw. We will visit Yoke Sone Kyaung monastery a fine teak building with some beautifully crafted reliefs. 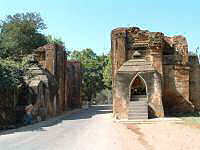 A host of small white stupas interspersed with some Italianate monasteries, stand near Yoke Sone Kyaung. Then on to a small temple Thartana Yaunggyi to look at a Buddha image made of bamboo. 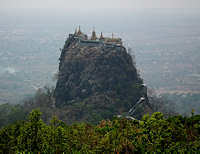 We will drive to lush Mount Popa the home of the nats (spirits). It is said that in 442 BCE as a result of an earthquake out of the barren Myingyan plains rose Mount Popa. Popa is the Sanskrit word for “flower”. Once at the summit of Mount Popa enjoy the stories about the resident nats Mr Handsome and his sister Golden Face. The afternoon will be spent back in Bagan to visit the great golden pagoda Shwezigon, begun by King Anawrahta and finished by his son King Kyanzittha in 1087 AD. 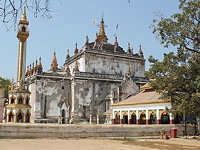 The Shwezigon holds a special place among Burmese pagodas for two reasons: it was the first major monument built in the Burmese (as distinct from Mon) style following the country’s conversion to Theravada Buddhism, and was the first pagoda to have nat (spirit) images allowed within the precinct. The Shwezigon is said to contain important relics of the Gautama Buddha, two bones and a copy of a tooth. The day’s finale is a quiet moment on the terraces of the Pyathatgyi Temple watching the light change on the pagodas which exude antiquity and mystery. Finally the sun sets behind the hills on the far side of the Ayeyarwady, filling the sky with a reddish glow, a magic moment. This morning leave boat & transfer to airport for your flight to Yangon. Upon arrival transfer to hotel. Today's city tour of Yangon includes the Sule Paya, Mahabandoola Garden, Bogyoke Market. After lunch we will take a walk through bustling Chinatown, and visit the Khant Hoke Chinese temple. We also take you on a walking tour to see many colonial buildings in town & many old Chinese houses in Chinatown district. At around 4 o'clock we will visit the world famous Shwedagon Pagoda and watch the spectacular sunset & change of colour of the gold pagoda. This morning tour will include Botataung Pagoda, Karawein Hall, Chaukhtatgyi Paya, Kaba Aye Paya etc., and a trip to see the white elephants. Todays tour also includes a visit to the wonderful 100 years old Strand Hotel that still retains all the grandeur of yesteryear. A short walk to see the riverbank on the other side with local ferry crossing along the river. After lunch transfer to airport for your return flight to UK. Arriving back UK next morning. 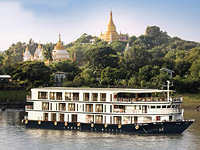 This leisurely and luxurious cruise explores the Ayeyarwadi River upstream from Mandalay, then downstream again to Bagan.